The body of the craft gave an impression of the V-shape but somehow seemed almost semi-transparent, blackish in color and almost shadowy in nature. The four lights were very large, bright white to yellow in color and steady, no blinking or fluctuations. 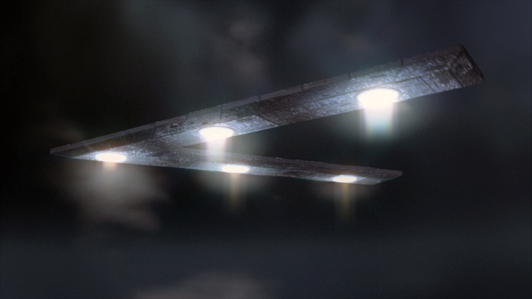 This large craft flying over head made absolutely no noise, it floated by with an eerie kind of silence. It traveled in a southeast to northwest direction. I got to see it fly overhead for a solid 10-15 seconds before the neighbors tree blocked it from my view. I tried to run to the front of the house as quickly as I could to catch back up with it, but could no longer find it in the sky anywhere. This all happened between the minutes of 12:04 – 12:05AM 10-02-12. The most up-close and craziest sighting Ive seen in my adult life! And to think, I witnessed all of this just because I wanted to go outside to get a breath of fresh air and look at the full moon before going to bed!!!! These are the best images I could find on the net that looks almost just like the UFO we saw last night. The one major difference being that the craft we saw had four lights, two on each side. Not to say there could have been a place for a light in the front and center, but maybe it was turned off? NOTE: The above image is a rendering.